Széchenyi Lánchíd, or Széchenyi Chain Bridge, which links Pest’s Roosevelt Square with Buda’s Adam Clark Ter, was another of Istvan Széchenyi’s great initiatives. Opened in 1849, it was Budapest’s first permanent trans-Danube bridge. The bridge was designed by the English engineer William Tierney Clark, who modelled it on one he had built earlier across the Thames, at Marlow, in England. Construction was supervised by Scottish engineer Adam Clark (no relation to the Clark who gave his name to Budapest’s famous Square). The pairs of lions at each of the abutments were added in 1852 and in 1898 the bridge was officially named the Széhenyi Lanchid. Its steel structure was totally updated in 1914 and entire bridge was rebuilt in after World War II. At the time of construction, the Széchenyi Chain Bridge was hailed as a wonder of the world. With a span of 202 metres, it was longer than any bridge hitherto known to man. Its cast iron decorations and its balanced, dignified composition placed it among the most beautiful industrial monuments in Europe. Most importantly, the Széchenyi Chain Bridge had an enormous significance in Hungary. Besides its advantage in transportation, the “Lánchíd” seemed to stand for advancement, national awakening, and the linkage between East and West. It reflected the confidence and optimism of the era of the Dual Monarchy. Furthermore it forecast the later unification of Buda and Pest as Budapest. According to popular rumour, the sculptor of the bridge’s lions was so relentlessly mocked for creating animals without tongues that he threw himself into the Danube. The lions, as it turns out, actually do have tongues but they are unable to be seen from the bridge. In 2001, Hungarian stunt pilot Peter Besenyei was the first to fly upside down under the bridge. His feat of daring (or madness?) set a trend for manoeuvres in today’s Red Bull air races. 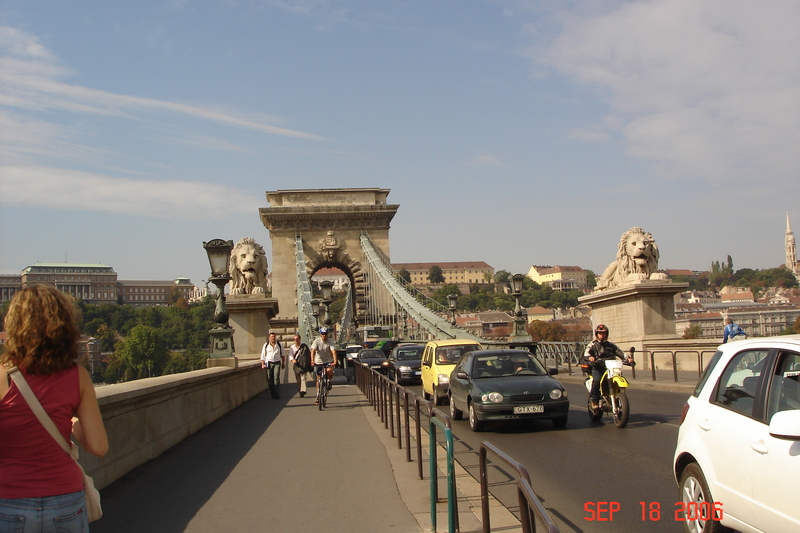 Széchenyi Bridge also starred in the 2002 film I Spy.